While Tom Holland continues his press tour for Spider-Man: Homecoming, the actor has revealed that the Marvel One-Shot short films is being resurrected. This comes just a few days after the young actor confirmed an Iron Man 2 fan theory, that the young boy with the Iron Man mask who stands up to a powerful drone, is in fact a much younger version of his Peter Parker character. Now it seems the actor has spilled the beans on another Marvel project in the waiting, after revealing he wants to make a short film with Paul Rudd as Ant-Man. These revelations come during a new Uproxx interview with Tom Holland for Spider-Man: Homecoming, where the actor was asked if he would like another MCU character to swing by, like Robert Downey Jr's Tony Stark, in the already-confirmed Spider-Man: Homecoming 2. The actor revealed the he would love for Paul Rudd to come by as Ant-Man, teasing an adventure where Spider-Man is shrunk and they go on a new adventure as a 20-minute short. When told that Marvel used to do short films like that on the Blu-ray and DVD releases of their movie, Tom Holland had this to say. "Yeah. I think they are planning on doing it again. I probably just spoiled a big spoiler. Kevin Feige is probably going to be furious." Kevin Feige teased in 2015, ironically, during the press tour for Ant-Man, that there will be more Marvel One-Shot short films produced, stating that there are a "backlog of ideas" for One-Shot shorts. At the time, the studio was busy getting their Phase Three lineup together, and Kevin Feige has also hinted that the studio could get back to making movies on a more "intimate" scale in Phase 4. If the studio is ready to make smaller movies, then it's certainly possible that they could spend some time focusing on getting the Marvel One-Shot short films back on track. The Marvel One-Shot shorts all debuted on Marvel Blu-ray and DVD releases between 2011 and 2014. The first two shorts, Marvel One-Shot: The Consultant and Marvel One-Shot: A Funny Thing Happened on the Way to Thor's Hammer, both focused on Clark Gregg's Agent Coulson, while Marvel One-Shot: Item 47 followed a couple (Lizzy Caplan and Jesse Bradford) who finds a Chitauri gun, in the aftermath of The Avengers battle in New York. Marvel One-Shot: Agent Carter brought back Hayley Atwell as Peggy Carter, and paved the way for the TV series of the same name, and Marvel One-Shot: All Hail the King was set in the aftermath of Iron Man 3, showcasing Trevor Slattery's (Ben Kingsley) time in Seagate Prison. 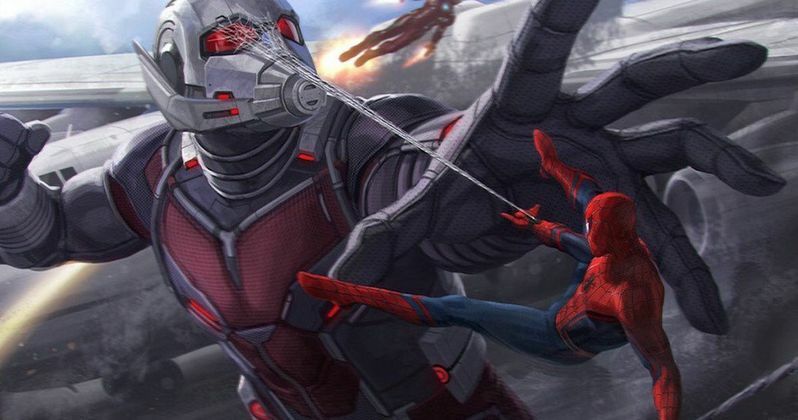 While we have no confirmation that this Spider-Man and Ant-Man short film will happen, it's worth noting that the sequel Ant-Man and the Wasp will start filming this summer in Atlanta, and it's possible that Tom Holland could swing down to film this short before principal photography begins on Ant-Man and the Wasp. That is only speculation, and there is no clear-cut evidence that a Spider-Man and Ant-Man short is happening, but it's possible that it could be shot in time to put it on the Spider-Man: Homecoming Blu-ray and DVD release, presumably later this year or early 2018.